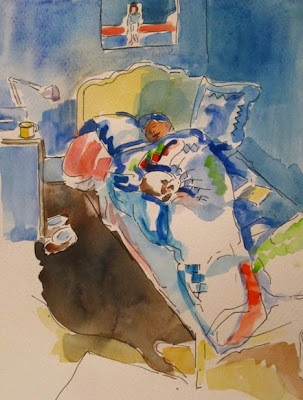 Barbara Muir Paints: Love is something else -- My man! suits me -- who gets what I mean most of the time. everyone likes funny people, or better yet -- loves them. I've drawn and painted Steven many times over the years. him is our school house in Nova Scotia. know you care about them, and to make the world a happier place. Have a loving your life day! I love this blog post! Such beautiful paintings and drawings of the love of your life! His sense of humour is evident in your portraits of him. What a wonderful overview, I am smiling as I type this. of him are serious. I'm glad that comes through to you.